Some champagne bottles are rarer than others. 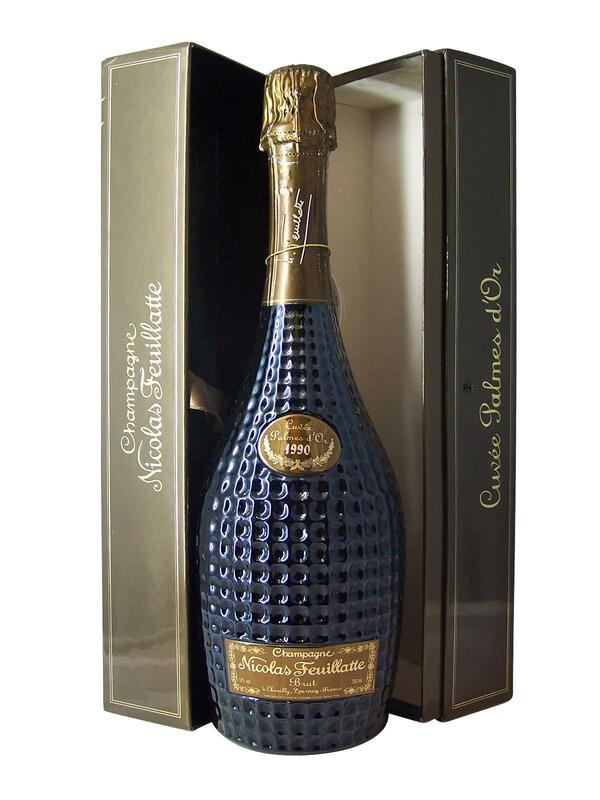 This is the case of this bottle of Champagne Nicolas Feuillatte Palme d' Or 1990. Very rare, there are only a few remaining bottles in circulation in the world (usually these bottles are only available during private tastings). Recognisable between thousand thanks to its original bottle, the Cuvée Palme d'Or of Nicolas Feuillatte is produced from a blend of Chardonnay and Pinot Noir. In the glass, the Champagne Nicolas Feuillatte Palme d' Or 1990 presents a beautiful deep amber colour. On the nose and palate, the Palme d'Or 1990 reveals an incredible aromatic richness, with sweet and salty notes of honeysuckle, ripe apple, dried fruit and walnuts, accompanied by notes of roasting and woody hints of oak barrels. Complex and delicate, the Champagne Nicolas Feuillatte Palme d'Or 1990 has a silky and velvety texture with an infinite depth in the mouth that leads to a long and delicious finish.